I have memories of going on the Steel Pier in 1928, when I was 11, packing a lunch and staying there all day so we could see the water sports and as many shows as time would permit. Steel Pier was a place I never tired of . Each week the acts and the movie would change. There was a fun house outside one of the movie theatres, and a house of mirrors, also some antique furniture. Trained parakeets would perform really unique tricks, such as picking up a piece of paper and bringing it to a special box. A magician would perform marvelous card tricks and sold special decks of cards. There were clowns who would dress up in early 1900s bathing attire and perform all types of antics using the Pier and the ocean. And there were high-wire acts involving walking and riding a bicycle across the ocean from the stage to the spectator sections. Work on the Pier hardly seemed like work at all. We were young, strong and athletic. We were the ones working behind the scenes to make the Pier a famous attraction. All the plumbers, electricians, carpenters and painters were in-house. Every year, we repainted benches and replaced broken stairs, worn dance floors, and rails along the ocean. When the Pier closed after breaking the attendance record for Labor Day Weekend 1934, we had 2 hours to clean four theatres before we opened for business again. Our work on the Pier was a round-the-clock effort. From 1935 to 1937, my friend Walter Rossi and I took jobs as guards for the dressing rooms of the Miss America Pageant, held at the Marine Ballroom. The work was exhilarating. We wore white shirts, white flannel trousers, and white bucks. We stood guard in front of the doors to make sure no one tampered with the costumes or bothered the contestants. In 1937, I got a lucky break and became the manager of the Music Hall. My last job on the Pier was as Assistant Manager of the Front, operated by James Rock. James taught me a lot about show business. The Pier averaged 35,000 visitors a day and was the place to see and be seen. Gentlemen wore their best suits, and ladies wore their best dresses, hats and furs. On the Sunday before Labor Day in 1934, the Pier set an attendance record: 89,000 visitors during the 20 hours the Pier was open. That same weekend, the Million Dollar Pier drew 62,000 people. Life magazine wrote an article about this event. In 1939, I left the Steel Pier. Other ways to sneak in was from under the Boardwalk via the Fun House... quite scary and very dark... Guess we weren’t very claustrophobic then… The other was so obvious and stupid... the old squeeze through the bent gate when Lester Jackson would see us from his office and come out after us. We always outran him. Once, he was MC at the Tony Grant show and spotted us in the back. He had us removed by the security guards, but we were back the next day. I can remember getting to the reserved seats section in the Music Hall, which cost 25 cents extra, by crawling between the seats on the floor down to the front rows. Nice. 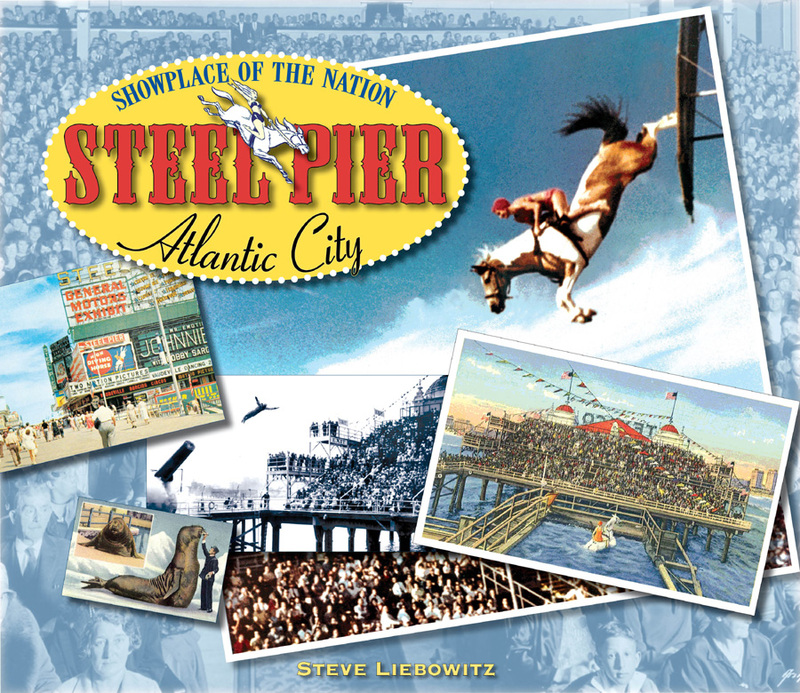 Steve Liebowitz has been researching Atlantic City entertainment history and the Steel Pier for many years. He has written articles for the Baltimore Sun, Baltimore Jewish Times, and Generations, the journal of the Jewish Museum of Maryland. He wrote about the old days of Wildwood, NJ in that Shore town’s newspaper for six years. After writing and producing commercials for CBS Radio, he wrote, co-produced and co-hosted “The Rock & Leebo Show” and has now gone out on his own with his comedy sports program “The Leebo Show” heard in Baltimore. A graduate of the Chicago Academy of Fine Arts, he has also painted animation cels in Chicago’s Cioni Studio. Steve is a student of old theaters and show business history and is involved with historic preservation as a member of the Theatre Historical Society of America. He lives outside of Baltimore with his wife Andrea, where he dreams of living near an ocean and a boardwalk.